Review of Brad Pribbenow, Prayerbook of Christ. Dietrich Bonhoeffer’s Christological Interpretation of the Psalms. Lanham: Lexington Books/Fortress Academic, 2018. Ppxxiii, 221. ISBN: 978-1-9787-0105-2 (cloth); ISBN 978—9787-0106-9 (electronic). Brad Pribbenow articulates these convictions cogently. The book is well-argued, being not just a chronology of Bonhoeffer’s writings on the Psalms but a study of how and why that thought changed in significant ways over time, in response to the changing and dramatic circumstances of his life and the impact of particular sources (Luther, Holl, Barth and others) on him. One of the book’s strengths is its setting of the historical background of Western Christianity’s treatment of the Psalms over the centuries, into which Bonhoeffer emerged in the first half of the 20th century at a critical juncture in the crisis facing post-liberal theology and biblical interpretation. It is this combination of close study of the psalm-related Bonhoeffer material (detailed to a degree which I think is quite new in Bonhoeffer scholarship) with the larger story of biblical interpretation which gives much of this book its value. The book thus makes a significant contribution both to Bonhoeffer literature and to the study of biblical exegesis. It merits study by Bonhoeffer-focused students and readers, but also circles concerned more widely with biblical interpretation, and indeed by students of liturgy as well. The book is structured in three parts: a brief history of Christological interpretation of the Psalms; the influences and development of Bonhoeffer’s Christological interpretation of them; and Bonhoeffer’s later (from 1940) interpretation. The text is impressively well documented and referenced, with the relevant major sources and original Bonhoeffer texts having been analyzed. The tone is appropriately objective and balanced in argument, weighing both the strengths and weaknesses in Bonhoeffer’s exegesis, as the author sees them, with a useful recapitulation of the argument in conclusion. While an enthusiast for Bonhoeffer’s approach as a whole Pribbenow is not uncritical at certain points: for example, whether Bonhoeffer’s exegesis lacks an eschatological perspective, and whether he sufficiently attends to the original Hebraic context of the Psalms. A question which habitually presents itself in any discussion of Bonhoeffer and his use of the Old Testament, is that of his attitude to Judaism and the Jews. In the context of Nazi Germany this was obviously a major issue and it is one which will surely be in the minds of many readers, especially given that in today’s context Holocaust and post-Holocaust studies feature so prominently. They will want to know how Bonhoeffer’s interest in the Hebrew scriptures takes on significance given the anti-Semitic context in which he was writing. This is to be seen against the whole background of Holocaust studies, and the allegation which has gained ground since the 1980s that Bonhoeffer, for all his anti-Nazi stance and actions, manifests some underlying anti-Semitic tendencies and acts in a typically presumptive Christian way towards the Psalms by “stealing” them for Christian purposes. Pribbenow is aware of this question, devoting a section to it (pp96–98), and suggests how the issue can be seen as part of the series of paradoxes or ”oppositional realities” in Bonhoeffer’s life and thought. : “…in Bonhoeffer we are not dealing with a simplistic, two-dimensional thinker who was always and forever straightforward and consistent in his theories and arguments”, and we may have to accept that there are some claims which must remain “a troublesome mystery”. The same might be said, of course, of the Psalms themselves. Keith Clements was formerly Senior Tutor at Bristol Baptist College and Part-Time Lecturer at the University of Bristol. He is the author of Bonhoeffer and Britain and is the editor of DBWE:13 London, 1933-1935. Brad A. Pribbenow is professor of Old Testament and dean at Lutheran Brethren Seminary. 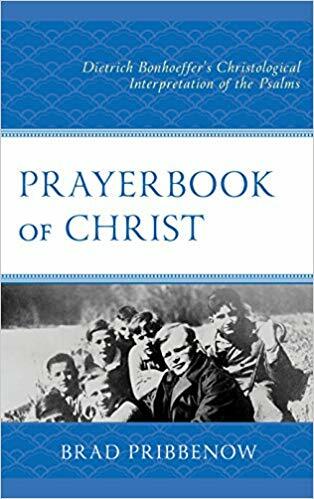 You can purchase a copy of Prayerbook of Christ: Dietrich Bonhoeffer’s Christological Interpretation of the Psalms at the following links.